Amoeba – Situated near Block 84 and Block 90, Amoeba is the food court thronged by the male trainees mostly. 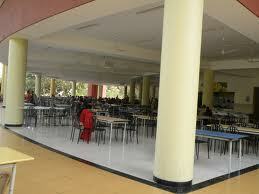 It is in the midst of Boys’ Hostels and a popular food court. It’s more crowded during breakfast and dinner time, and you might not get anything if you hope to be there for dinner after 8:45 PM. The food court is mainly managed by Dilli Darbar and other kiosks include Juice Junction, Dosa Delight, MDP, American Sweet Corn (mini-kiosk). I never had a big inclination for this food court except the Chicken dry and Chicken Kebab whichare really good. The idli and aloo paratha during breakfast are good too. 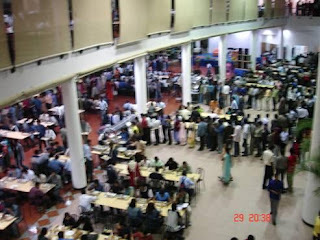 Maitri – This food court is in between the girls hostels and it is one food court where you get to see long queues at 7:30 PM itself (the official time for start of dinner). I loved the chicken hyderabadi and chicken fry that was served. Also included is a Juice Junction, Aroma Bakery and a soda-lime kiosk. The soda-lime is simply superb. Try out! There’s a Tandoori Nights held every Friday. To enjoy the Tandoori Night delights you need to be pretty early in order to avoid the queue which at times is really annoying. Priced within 80 bucks, the tandooris are a delight. Also available are the Paneer Tikkas which are mouth-watering. So if you are a vegetarian and want a change for your taste buds be there! Vista – This food court is where all your pizzas get delivered from. Most of the time it remains empty and you can always go there to enjoy a pizza with your friends! 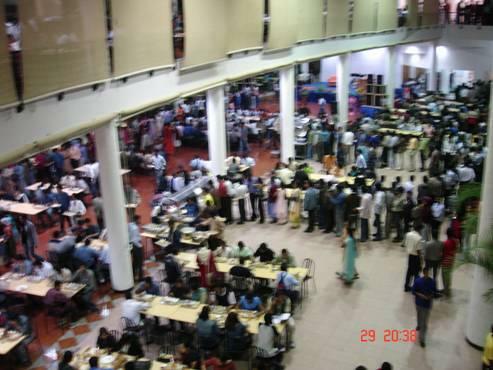 Magna – The most crowded food court when it comes to lunch on any working day. Situated in B2 of GEC-2 it is served by two vendors – Pathankot and Madhuram. Pathankot is relatively North Indian and Madhuram specializes in South Indian servings. I personally enjoyed the breakfast that Madhuram offered and Pathankot servings never delighted me. However, you might try out the Chicken Biryani there, it’s good (but no where near to Oasis or Arena). There’s Aroma Bakery, MDP, Dosa Delight, Juice Junction, Dilli Darbar. Dilli Darbar is a small kiosk, however it attracts large number of trainees and it is very famous to those hailing from North India, particularly Chandigarh, Haryana and Delhi. The queue at most kiosks are long and frustrating at most times. ILI Food Zone – Situated behind the Infosys Leadership Institute (ILI) this is one food court where you get Pav Bhaji, it’s quite a craze and if you really want to have one, be there by five in the evening. I also liked the Idli and Upma that it offered during breakfast. Not a fan of this food court, otherwise! Arena – Another food court that gets crowded during lunch time! Whenever I hear the name of Arena, only one thing comes to my mind, the Chicken Biryani(it's a two-floor food court and you will find chicken biryani being served on the first floor). It is the best in the campus, so you should never miss out on the biriyani served here! I once had a Thali here, but didn’t like it. It also offers north indian and south indian meals. Juice Junction is a good kiosk and you get to buy fruits from here. Floatel (Floating Restaurant) – Situated behind the Information Centre, this is the one and only place where you get lunch and dinner Buffet at the price of 210 bucks. If you want to treat your friends you can consider this place; however always know the menu for the day before you book. Again, you need to book only when you have more than ten accompanying you, else just inform them! Both veg and non-veg items are available here, however I never liked the veg here. The chicken and mutton preparations are good, however the fish items are awful and I would never suggest you to go there and waste your money and energy for the same! Sweet items are great. Let me warn you, don’t expect heavenly food there, you will be disappointed. Not much to tingle your taste buds, but a good place to have fun and food once in a while! That’s all from my food experience at Mysore! Do reply and let me know if you liked my write-up and tips. Do share your experience on the food there at the heavenly campus of Infy Mysore. miss those days of mysore! We are a homestay close by to Infosys near MYRA B-School and we cater to taste buds of young folks staying out of their homes and Mom's kitchens. For details, write to fantasia.stay@gmail.com and do not forget to provide your contact details. We will revert back .. Inform your friends, colleagues ... about yummy home-cooked food available close by..